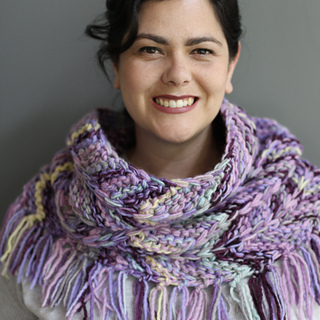 The cowl is 12¼”/ 31cm high and the pattern is written for circumferences of 30 (33¼, 36¾)”/ 75 (83.5, 91.5)cm, however, circumference is easily customizable. Sometimes leftover yarn scraps are too pretty to throw out, or let languish in my stash. 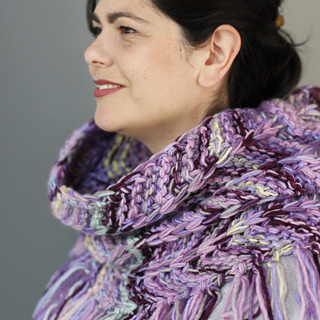 Such was the case for the pink and purple Malabrigo Worsted I used for this cowl design. 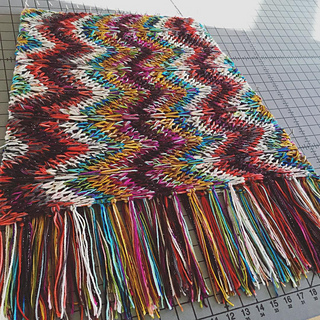 The project comes together quickly with large needles and there are no ends to weave in thanks to the feisty fringe. 3 worsted yarns are held together to create the thick stitches. 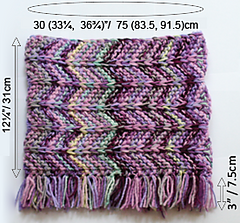 Use any 3 different colours, or 2 ends from one skein and a third from another. I found that I liked the depth of colour created in a stripe where the 3 yarns were similar in colour. For example, many stripes use 3 yarns in similar shades of mauve, pink or grey. 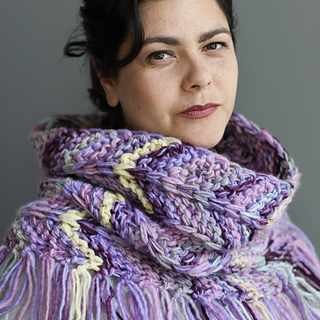 The cowl is worked side to side and joined; the length of the work corresponds to the finished circumference. Using highly-contrasting yarns together will yield a different look again. Use one or twenty colours. 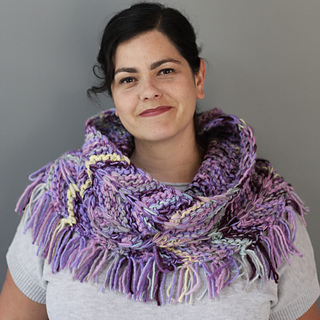 The cowl is 12¼”/ 31cm high and the pattern is written for circumferences of 30 (33¼, 36¾)”/ 75 (83.5, 91.5)cm, however, circumference is easily customizable. Sample shown is 34¾”/ 87cm circumference on model that measures across back between shoulders 16”/ 40.5cm. Bulky or Super Bulky scrap yarn for provisional cast on. Contrasting thin scrap yarn to use as life line, optional. US 17 (12 mm) knitting needles, large crochet hook, tapestry needle, large cutting mat (optional), and rotary fabric cutter (optional). 12 sts/12 rows over 4” (10cm) in pattern.